Jupiter in leo 2015/16: who benefits? Jupiter moves into Leo on July 13 2015 and remains in the Sun's sign until August 10 2016. So, who will benefit from this transit, and how? Well, everyone will benefit to some degree. However, there are particular signs that will benefit from this transit more than others. Firstly, I would base an interpretation on where your Moon sign is and whether Jupiter's transit will benefit your mind and your sense of purposefulness for the coming year. Jupiter gives us a sense of purpose which gets us out of bed in the mornings and keeps us on the right track. That is, if you have a strong Jupiter in your horoscope, and Jupiter's current transit is beneficial for your Moon sign. If you do not have a strongly placed Jupiter, i.e. a strong sense of faith and purpose, then transits can only modify this without your involvement in remedial measures on an ongoing basis. Jupiter's upcoming transit to Leo is beneficial for those who have their Moon sign in Aries, Cancer, Libra, Sagittarius or Aquarius, according to sidereal calculations. For all other Moon signs (Taurus, Gemini, Leo, Virgo, Scorpio, Capricorn and Pisces) the transit of Jupiter is not as beneficial. How do we experience Jupiter when it doesn't feel so beneficial? In short, it doesn't feel like your life is full of purpose and you may have to live without a sense of connection to a Divine plan. But it's not that bad, heh?! You will experience some benefit from Jupiter in the coming year according to the sign positions of Aries, Leo, Sagittarius and Aquarius. However, you may not feel as blessed as those with their Moon in the signs Aries, Cancer, Libra, Sagittarius or Aquarius. The best way to see how you experience this transit overall would be to consider the Ashtakavarga system of transit interpretation, which takes into account Jupiter's transit from all of the planet's - not just your Moon sign. You may have to consult a Vedic astrologer for this information. However, the Moon is so important when analyzing transits as it represents our sense of self and our mental facilities. Therefore, we have to consider the Moon's role in how we experience Jupiter's transit through Leo. Although the actual circumstances of Jupiter's transit may create many gains for you, you may not actually feel its benevolence without the Moon in any of the sign's listed. But remind yourself of the benefits of this transit when you do experience them. One way we astrologers do this is by looking forward to these by the transits of Jupiter. And you can too! We can all gravitate towards Jupiter to develop a sense of flow in life - a sense that everything is happening exactly as it should be. This will be the case in the sign Leo for the coming year, and the sign's it will aspect while in Leo, i.e. Aries, Sagittarius and Aquarius. Look to see which areas of life you experience these signs. This would mean the house position of these signs in your Vedic astrology horoscope, as per the sidereal zodiac. Always count inclusively from your rising sign (time of day required for this calculation) to these signs and you will be able to ascertain the house positions and, thus, the areas of life you will benefit from growth and protection because of Jupiter. To get a sense of this in a very practical way, let us not forget that Jupiter is actually physically protecting us by diverting asteroids which would otherwise be set for a collision course with us here on Earth. Actually, Jupiter also sends some our way too which would otherwise have missed the mark by a long shot! I guess like many experiences in life, we sometimes feel protected in our decisions, but sometimes, when we are out on the cutting edge and making mistakes, we have to experience a sense of threat to keep us on the right path. It is interesting to note that Jupiter represents both a positive and negative area of life for each sign to some degree, except the signs it rules, i.e. Sagittarius and Pisces. How will you experience Jupiter in Leo? To follow is a list of some of the possible benefits of having Jupiter in Leo for your sign. This will be somewhat restrained by the influence of Saturn which also aspects the sign Leo, especially during the first week of August 2015, as well as next year from March, when Saturn aspects Jupiter exactly. This is not particularly helpful to the significations of Jupiter which include finances, laws, a sense of hope and idealism, faith and religion. In relation to the sign in which these influences occur, however, it may be said that when both planets of destiny, Jupiter and Saturn influence an area of the horoscope, there is a greater chance of the results of that area of life coming to pass. With hope and idealism (Jupiter), tempered with hard work and discipline (Saturn), we are sure to see some results in Leo. For the signs between Scorpio and Taurus (counting clockwise), except the sign Pisces, the same cannot be said for the following year. These signs experience only one or the other influence. In other words, either Jupiter, i.e. hope, or Saturn, i.e. discipline, are influencing. But not both at the same time. Therefore, the signs Aries, Sagittarius and Aquarius experience only Jupiter's hope and we feel this as an idealism in these areas of our lives which may or may not actualize. The signs Taurus, Scorpio and Capricorn experience only Saturn's discipline and we feel this as the drudgery of hard work which doesn't seem to have a purpose. In both cases, your ideals need a firm grounding in reality and your hard work would benefit from a sense of the Divine at work in your life. Let me draw your attention back to Jupiter and the benefits of its transit for each sign. Put very simply, Aries experiences more creativity, Taurus, a better home environment, Gemini, better communications, Cancer, greater wealth, Leo, more self-confidence, Virgo, more foreign opportunities, Libra, larger network of friends, Scorpio, increased profile at work, Sagittarius, possibility of travel and/or studies, Capricorn, more meaningful change, Aquarius, growth in relationships, and Pisces, better health and routines. Aries: Greater self-expression through faith in one's abilities, leading to more profound experiences. Taurus: Positive change in the home where one grows, perhaps even moves. Gemini: More meaningful interactions with immediate others, personally and professionally, giving a renewed faith in humanity. Cancer: Communicating from a place of sobriety gives meaningful work opportunities and greater income. Leo: Personal change allows greater self-expression and confidence when dealing with life's big lessons. Virgo: Foreign travel and a charitable nature expands your worldview, creating better work routines and relationships. Libra: Gains from one's own efforts pay off now, connecting with a bigger network of people; improving your self-expression, health routines and relationships. Scorpio: Self-worth and self-expression increase visibility at work and improve conditions at home also. Sagittarius: Growth on many levels which may be experienced through travel and/or studies, leading to better self-expression. Capricorn: Letting go of the need to control that which is uncontrollable allows for deeply touching experiences. Aquarius: Gains through relationships of all kinds positively affect your self-confidence. Pisces: Better health through carefully selected routines and work schedules. The transit of Jupiter to Leo is one of the key shifts in 2015 and moving forward into next year as it transits the sign until August 2016. While Jupiter was exalted in the sign Cancer it led to high ideals and expectations from life. Now in Leo, Jupiter gets to work in order to test those ideals and expectations in a more determined and expressive fashion. It is time to get vocal about your ideal life. This is helped by Saturn's focus on the sign, which adds a hard work ethos to your big ideas. In a general sense, the sign Leo represents creativity, children and romance. The negative effects of Jupiter in Leo are a grandiose sense of self which is overbearing and pompous. Strongly held beliefs often display this pomp and show. We may get on our high horse. If this has a firm ground in something helpful and relevant to all concerned then this is not necessarily a bad thing. However, if the ideals are too lofty, and out of touch with reality, the subsequent rituals you perform may fall short and lack any real depth. Another possible negative result of this transit is the firm belief in action which is self-motivated, regardless of the outcome for others; believing you are all great and powerful; taking on much more than you can handle on your own. Thankfully, Saturn's concurrent influence will keep these negative traits in check somewhat, and keep us focused on bringing balance to this part of our lives. Jupiter represents a strong belief, a sense of connection, positive growth and opportunity. Overall, the areas of life you experience the signs Leo, Sagittarius, Aquarius and Aries, will feel the benefit of having Jupiter in Leo for the following year. Growth is possible in these areas of your life. But this is especially the case for those with the sign Leo as their rising sign. They have been experiencing Jupiter in the house of loss for the past year, with Saturn detracting from their usual steady self-confidence in recent months. With Jupiter entering their sign a fresh confidence is born. Although this is kept in check by Saturn and Rahu, there is a sense of new possibilities and lots of growth and change can be experienced in the next couple of years. 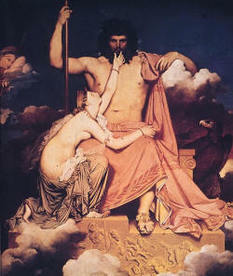 'Jupiter and Thetis', by Jean Auguste Dominique Ingres. (1811). distractions from our more meaningful endeavors and too much of a good thing if we do not reign it in. However, there is a very real possibility that you are at this point curtailing your extravagances (since the beginning of July 2015), and although this may waver over the coming months, the overall effect keeps us on the right track. The domain of Leo and Jupiter's lofty pursuits guarantees we don't get too carried away with sensual enjoyments. After our senses are indulged - and especially when we overdo it - we seek something beyond the body, and other bodies, and what they can provide us. The dance between these two 'good guys' in the planetary line-up over the coming months continues to ask us to look more closely at the relationship between these urges and impulses. Jupiter is placed in combustion from August 12 until September 10 2015. With the king (the Sun) on his throne during this time the priest is not visible and our decision making capabilities are questionable. During this time we must gain access to the inner strengths of Jupiter, i.e. intuition and not let the pomp and show of proceedings or an individual's exaggerated self-promotion win us over. Jupiter's outer representations, such as finances, laws, advisers and religious beliefs, come under some intense scrutiny during Jupiter's combustion. Mars joins Jupiter from September 15 until November 3 2015, coming into exact conjunction - and thus a 'planetary war' - on October 16. This occurs with Mars in a tough battle with Saturn, creating a lot of tension in our lives, especially on September 25. 'War' may indeed be an appropriate word to use when considering Mars' influence, and strongly held beliefs fueling the fire. Mars gives us the ability to see proceedings through regardless, as frustrating as they may be due to Saturn's influence. When all is said and done Jupiter brings the wisdom gained from taking inappropriate actions and speaking out of turn. As Jupiter and Mars come together exactly on October 16, and Saturn continues its restrictive influence on these planets - the Sun slips into its sign of debilitation, Libra. This knocks our confidence following these experiences which produce some dramatic results in September and through early winter. Venus moves alongside Jupiter and Mars in October, before it finds itself in its sign of debilitation by November. All of this points to the less savory aspects of these planets being expressed during the autumn and into early winter. The Sun in weakness brings Jupiter's egotistic overcompensation into play, as Mars confronted by Saturn feels like a tightening grip which may spill out into violent acts - all in the name of one's strongly held beliefs. In the meantime, Venus offers little in the way of compromise which leave us all feeling a little less considerate when dealing with our own shortcomings. Jupiter is also joined by Rahu, the Moon's north node, from January 2016, and for its remaining transit in Leo until August 2016. This will shake up many of Jupiter's significations. It is retrograde for the first four months of 2016; moving alongside Rahu during this time - making both appear to be moving backwards through the sign Leo from January until May - coming to exact conjunction with Rahu in June 2016. The sign Leo, and the areas of life represented by Jupiter, are up for a lot of change and growth as a result in the coming year. In a general sense, leadership is up for some major changes, along with changes and innovations in creativity and self-expression.